Every year, around this time we have the big paint brands declare their colour of the year. 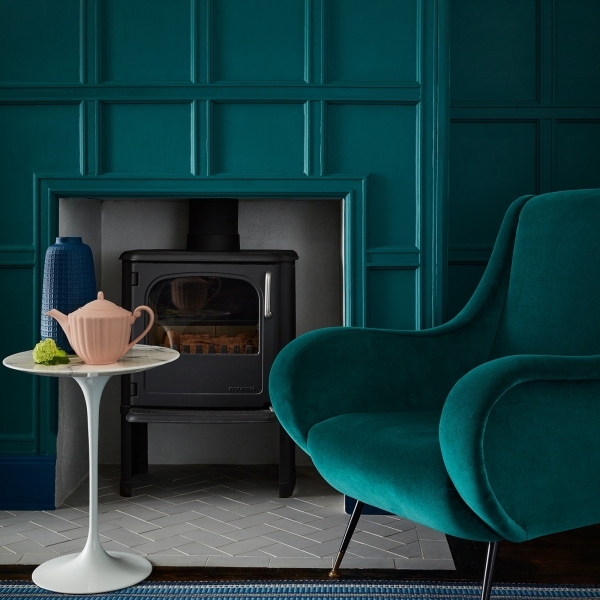 Dulux has gone beige this year with Spiced Honey, Farrow and Ball are introducing more pinks and Little Greene are backing, well green! But across the board, bold and brave colour is most definitely in. So Topps Tiles thought it was time their industry got in on the colour loving action! I was thrilled to be invited to be collaborate on the launch of the first Tile of the Year campaign. I’ve used Topps Tiles on plenty of my own projects over the years and their trend led ranges at a price that doesn’t pinch always impresses me. And I was doubly thrilled to be involved when I found out what the tile of the year was! Because its rich, its deep, its colourful…all the squeals, it’s teal! 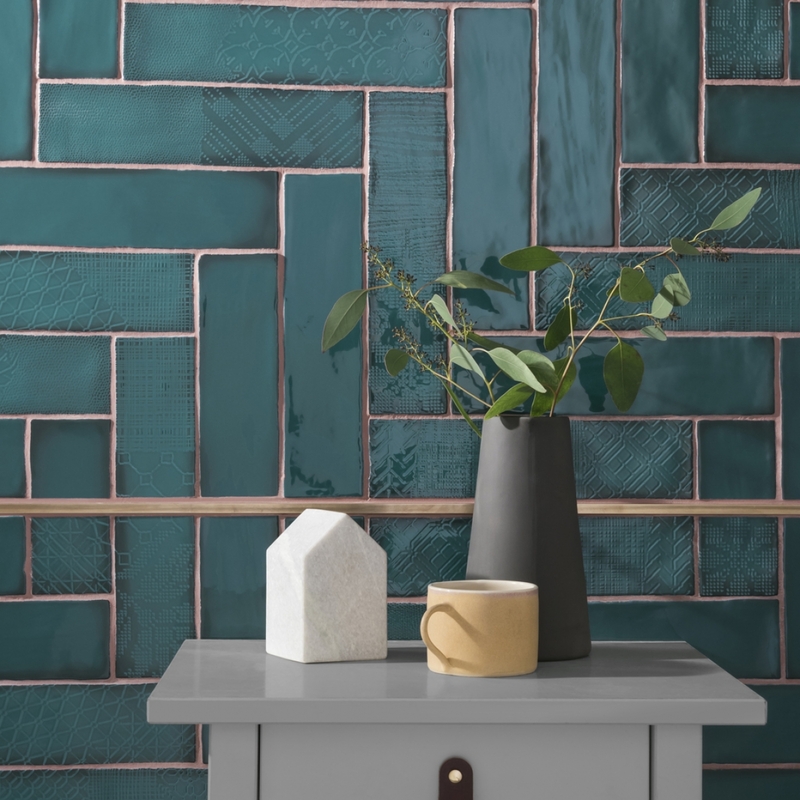 The Lampas Peacock tile is the most delicious rich hue and so perfectly in line with current interior design trends for a warmer deeper shades. The fashion for dark and moody hues is well cemented so it’s time to take the look all the way and commit to colour in the bathroom too! Unlike paint, picking the perfect tile colour seems like such a bigger commitment. You literally cement it to the wall, so no quick lick of paint when you tire of it. But, maybe for this reason, all too often bathroom design is beige and boring but with more people indulging in their own sense of style and feeling more confident with colour I can see this trend really taking off. So, no surprise, I am completely loving the power and impact of this colour and its effect on the mood and feeling. Hopefully we are well over the saying “pink and green should never be seen” phase, because I love mixing these two colours together, they are a match made in heaven! First up use the Lampas peacock tile to stunning effect by wrapping it all the way around the room which helps unify the space, with a lighter tile above helping to maintain a brighter look. The the pink basin then lends a cheeky piece of fun to this scheme. Pink is the perfect colour for bathrooms as it’s super soft and delicate and adds warmth here. 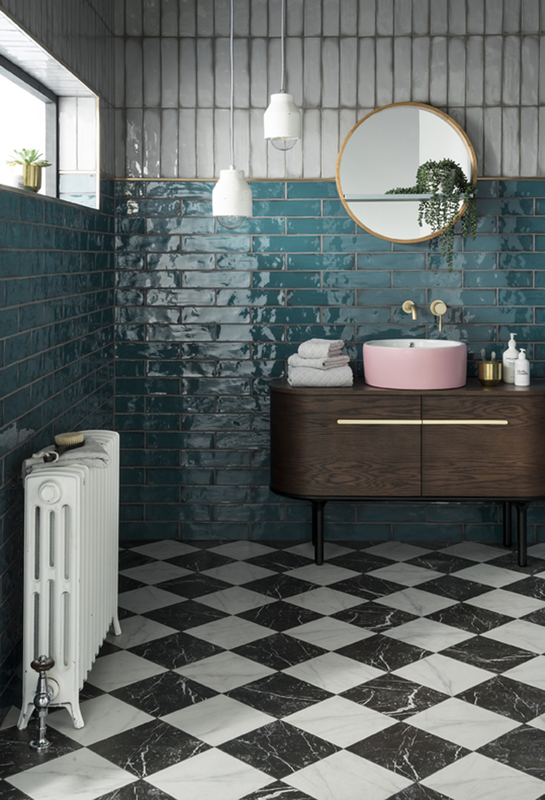 Following the continued trend for an eclectic mix of styles, we added a mid century modern inspired cabinet, modern pink counter top basin, and some industrial lighting, set against the Victorian style floor and radiator. The result is a scheme that feels individual and full of character. It’s a lot to take in but I’m a big fan and it fits in perfectly with the current trend for maximalist interiors. Next up, if we’re talking trends then it has to be gold brassware, which is totally eclipsing chrome right now across kitchens and bathroom design. 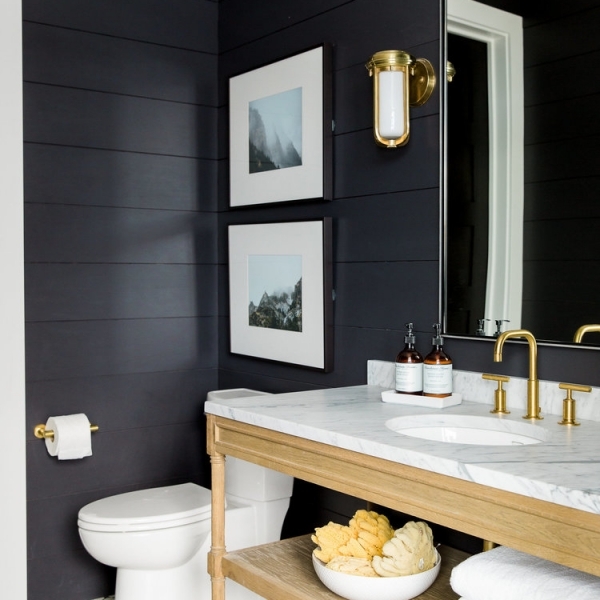 I’m loving the touch of glamour on the handles too but especially this brass tile trim that goes all the way around the room, finishing it off really beautifully. Another lovely styling tip when dressing your finished bathroom is to incorporate some natural elements. Real wood feels tactile and warm to the touch while a few potted plants really enhance the feeling of well-being. The Lampas tiles have a lovely distressed edge, which gives them a soft handmade, feel and along with the glossy uneven glaze give the wall tiles a lovely feeling of authenticity. This is a dramatic and very on trend look but what I love about the Lampas Peacock is they have a real timeless appeal as well. They might be tile of the year 2019 but I’d say they are already a classic. 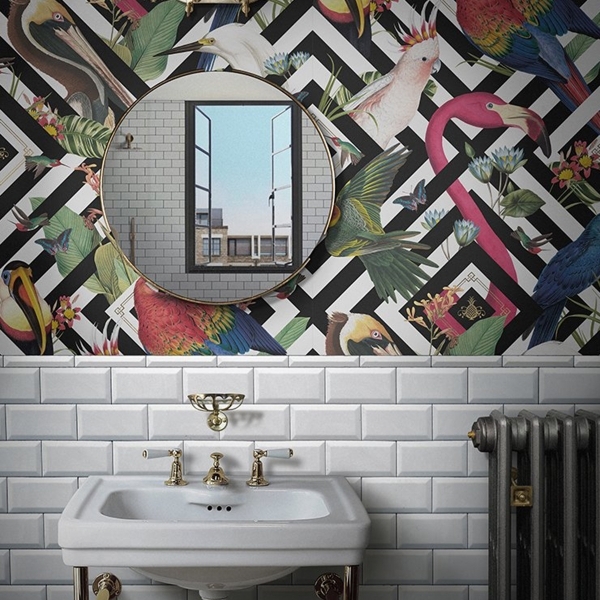 You can see more of the bathroom I styled for Topps Tiles in this video here. I love the whole bathroom a gorgeous scheme. Are you able to divulge the sources of the other products also? I.e sink, taps , mirror, cabinet as they are lovely also. Do you need to take any notice of colour trends and who sets them anyhow!